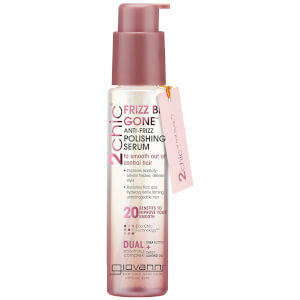 Tame textured, curly and out-of-control hair with the Giovanni 2chic Frizz Be Gone Polishing Serum; a smoothing, frizz-fighting formula to improve manageability. Fortified with Shea Butter and a nourishing blend of Macadamia, Argan, Moringa and Sweet Almond Oils, the non-greasy serum restores softness and shine, whilst banishing frizz and flyaways for a super sleek finish. Distribute a small amount onto hands. Smooth onto damp or dry hair. Style as desired. Cyclopentasiloxane, Dimethicone, *Cocos Nucifera (Coconut) Oil, Butyrospermum Parkii (Shea) Butter Extract, Prunus Amygdalus Dulcis (Sweet Almond) Oil, *Macadamia Ternifolia Seed Oil, *Argania Spinosa Kernel Oil, *Adansonia Digitata (Baobab) Seed Oil, *Moringa Oleifera Seed Oil, *Simmondsia Chinensis (Jojoba) Seed Oil, Fragrance.